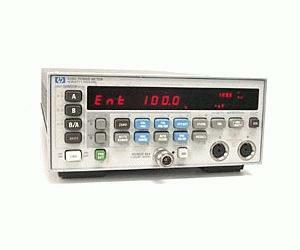 The Agilent 438A power meter is a dual-channel power meter designed specifically for ATE systems. The compact front panel saves critical rack space, while the dual-channel design allows simple and accurate measurements of the ratio and difference of power levels from two separate sensors. This meter is compatible with the 8480 series of power sensors. GPIB capability is standard on the 438A. For U.S. Air Force Modular Automatic Test Equipment (MATE) system application, Option 700 provides the 438A with the internal capability to be controlled by the MATE Control Interface Intermediate Language (CIIL).